For all my talk about sustainability, I think it's about time I mentioned at least one household cleaning item. Fact: "Most traditional laundry detergents are 75% water; even the new '2X concentrates' are 50% water". So when we add laundry detergent, we're adding mostly water to... water. Enter Dropps, a new type of laundry detergent. Well, new to the retail market. Dropps was developed in the late 80's by a cotton mill outside of Philadelphia as a way to clean the cotton without yellowing it. Fast forward to 2008: "Dropps are biodegradable and NPE- and phosphate-free, and dropps is packaged in a stand-up pouch to reduce its environmental footprint. dropps offers a convenient way to protect the planet -- the highly concentrated formula is made without the water that traditional laundry detergents needlessly waste." 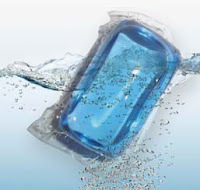 Without the water, the detergent is able to come in a pre-dosed water soluble packet, eliminating the labor and drips of measuring out of a jug. Dropps is currently a finalist in the Philadelphia Sustainability Awards (does Boston have anything similar? If not, we should). You can pick up Dropps at Target and Whole Foods, or order online at Amazon .